I don’t often leave the house during the wildfowling season without my trusty duck calls around my neck. I am a great believer in the use of calls on the foreshore, and I am convinced that they often enhance my sport, thus producing more food for the table. 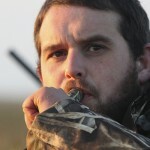 I carry the standard mallard call or two, and a range of goose calls for the numerous different species. However, I do have the odd extra call that can help pull in birds when others have failed.